Today, I’m going to show you how to browse, document, and manage models in 5 minutes with the Microsoft Excel data mining add-in. The assumption of this post is that you have already installed the data mining add-in for Excel and configured the add-in to be pointed at an instance of SQL Server with Analysis Services to which you have access rights. For this example, we will be using a tutorial spreadsheet that can be found on Codeplex here. 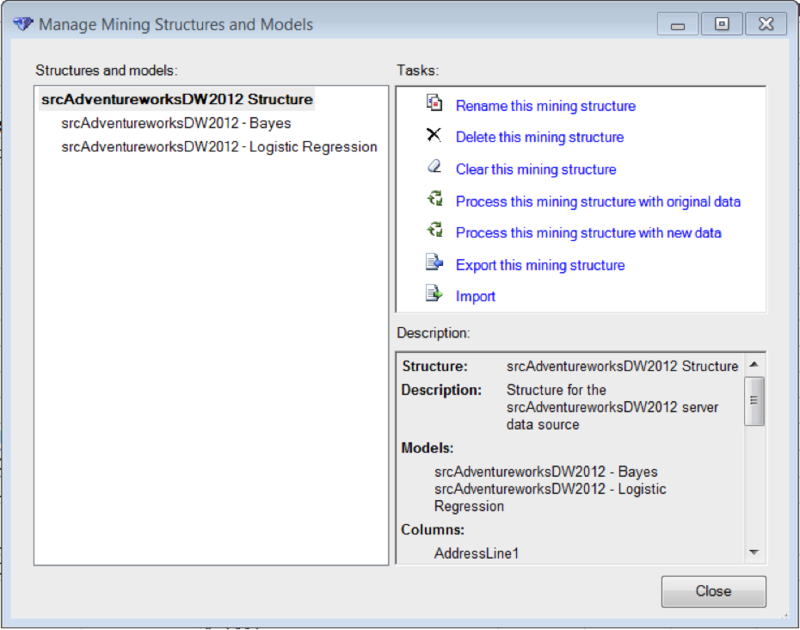 You also need to attach the AdventureworksDW2012 data file to SQL Server. The file can be downloaded here. Our goal is to create Browse, Document, and Manage one of the models that we have previously created. We go to the DATA MINING tab, the Model Usage group, and select the Browse icon. From here, we can see our models organized by mining structure used to create the models. Notice that when we click on each of the models, we can see the Model Name, Algorithm, Description, Output, and Input for a particular model on the right hand side. Clicking Next takes us to the Data Mining Model Viewer that we usually see after building a model. 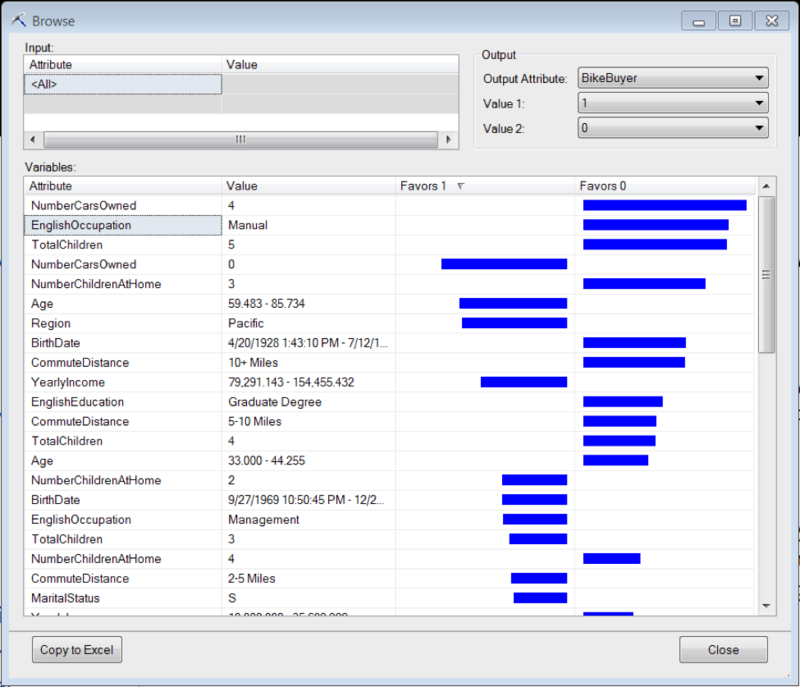 This allows us to explore the model by filtering on different attributes or comparing different results for the output. In our case, we only have a binary output (1 or 0), but this would allow you to be able to compare 2 out of N possible results for an output attribute. 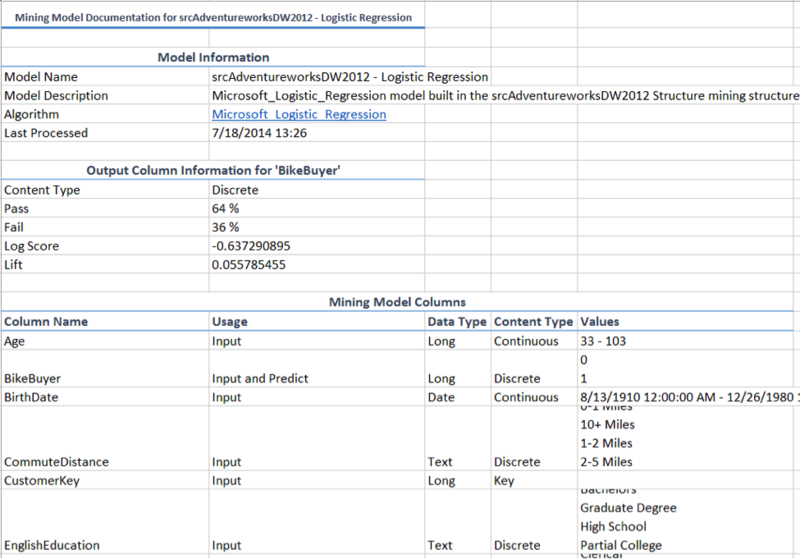 We go to the DATA MINING tab, the Accuracy and Validation group, and select the Documents Model icon. From here, we can see our models organized by mining structure used to create the models as they were when we browsed them. Like before, we can see the Model Name, Algorithm, Description, Output, and Input for a particular model on the right hand side. Select and model, and click Next. Then select Complete information. Now, Excel will create a new worksheet with information about the model from model performance to different ranges tested in the data. This will be very useful for evaluating the validity of a model for future applications. For example, we can see in our above model that we only considered folks who were 33 and older. This model would need to be re-run with new data if we wanted information on the bike buying habits of people in their 20s. We go to the DATA MINING tab, the Management group, and select the Manage Models icon. From here, we can see our models organized by mining structure used to create the models as they were when we browsed them. Again, we can see the Model Name, Algorithm, Description, Output, and Input for a particular model on the bottom right hand side. However, we see a new window pane with tasks that we can perform on different models. This allows us to manage all of our models from a central location and do things such as rename, delete, clear, process, export, or import for a particular model. 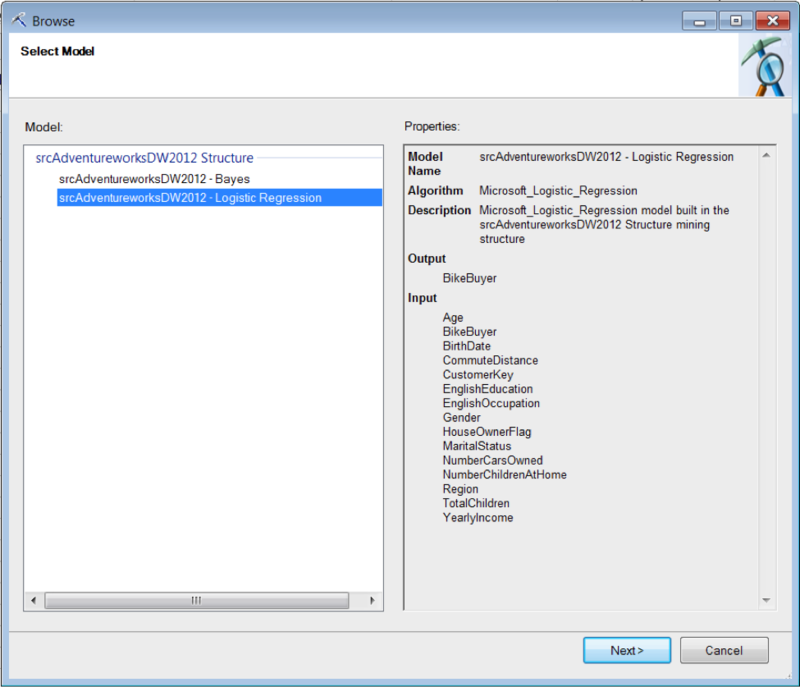 And that is how you can browse, document, and manage your data mining models in less than five minutes using the Excel Data Mining Add in.